Ed Speleers is no stranger to period drama. He played Edward Seymour in Wolf Hall and Slean in Beowulf: Return to the Shieldlands, but he’s most well-known (to American audiences, at least) as Jimmy Kent, an ambitious 1920s footman in the latter seasons of Downton Abbey. 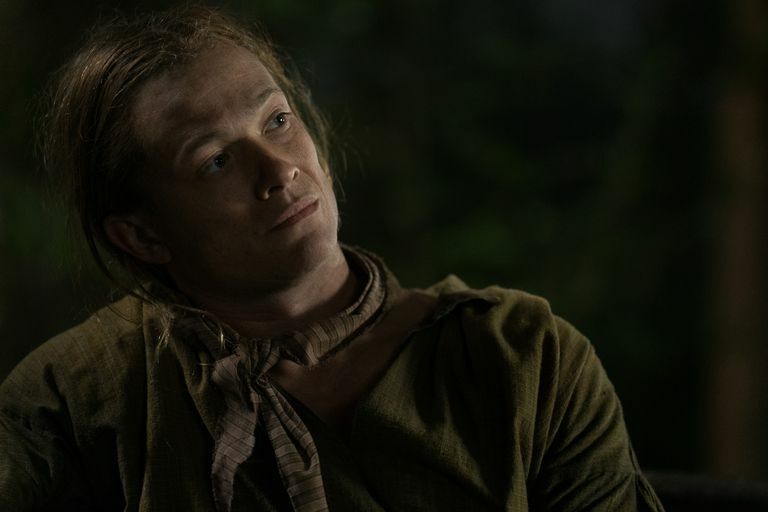 He joins the cast of Outlander this season as Stephen Bonnet, a smuggler, pirate, and a different type of villain than we’ve seen on the show thus far. Speleers makes his debut in the first few minutes of the season’s premiere, as a captive criminal awaiting the noose. But as the character is wont to do, he manages to evade death relatively unscathed only to pop up later that night, hidden alongside Gavin’s corpse in Claire and Jamie’s cart. They aid his escape from the law, only for him to betray them later on. The episode ends as his band of thieves violently ransacks the Frasers’ camp along the river. The pillaging is set to an anachronistic soundtrack of Ray Charles’s “America the Beautiful” (which is also, of course, the name of the episode). The contrast of the vicious confrontation with the patriotic tune emphasizes a theme of the coming season: perhaps the American dream isn’t beautiful for everyone, after all. Below, Speleers shares why he’s reluctant to call his character a villain, breaks down that final gripping scene, and coyly previews what viewers can expect from the smuggler in the season ahead. How would you describe the character of Stephen Bonnet? Troubled. I think he comes from a very troubled past, and he’s a survivor. I think in any situation that he finds himself in, he’s always looking for his way out, to see who can help him get out of that situation, and what is the best outcome for him. I think that’s what’s interesting about him. You never quite know which route he’s going to use to get something out of a situation. Is he going to try and charm people or woo people or be aggressive and intimidating, or tactical? There’s a lot to him, which is what you want as an actor. You’re always looking to try play roles that have, at least on the page, as much depth as possible. His lone motivation is survival, and also I think he’s got plenty to prove to the world. I think that anyone who is abandoned at a young age like he was, feels very much like it’s him against the world, but I think he wants to be a gentleman as well. He considers himself sophisticated to a degree, and I think he would like to better himself if he could. Very talented actor. I didn’t like Stephen Bonnet in the books and I don’t like him in the series. I must admit, however, that Ed Speleers plays the role to perfection.